K and RJ at Zenergy Dog Training are amazing! 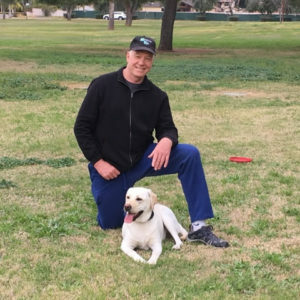 We brought our 1-year old lab puppy, Charlotte, aka Charlie, to Zenergy’s boot camp to help her to learn basic obedience and calm her state of mind. Charlie did not have any aggression issues and basically was a lovable, sweet, but needy girl. She simply was so excited all the time that she would jump up when she saw you, go crazy with other dogs, chew pillows, take shoes and anything else she was not supposed to have, making the chase her favorite game. She would constantly look for mischief and she was running us around. After boot camp, she was the same loving sweet girl, but now listens to commands and is a joy to be around. She walks right beside us without pulling and we can take her wherever we want knowing we are in control. Life is so much better with Charlie post Zenergy boot camp!